100% pure Garcinia Cambogia formula for natural weight loss. Proven as an effective dietary supplement to help individuals quickly lose weight . Taking all Natural Garcinia Cambogia works in two ways: It naturally prevents and blocks fat from being made and works as an appetite suppressant. 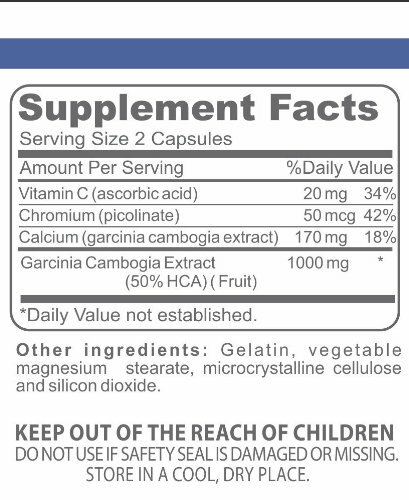 Best of all our Natural Garcinia cambogia extract is perfectly safe to use non-drug formula has no caffeine, no artificial ingredients which is common with dietary weight loss supplements. Simply, Garcinia has a natural extract called HCA (Hydroxycitric Acid) this is the ACTIVE ingredient extracted from the rind of this pumpkin shaped fruit that BLOCKS FAT your body would produce. HCA helps to BURN FAT your body is already storing and REDUCES CRAVINGS. Our Garcinia Cambogia has 50% HCA ,( Dr. Oz recommends at least 45% HCA) Another positive effect of Garcinia Cambogia is a healthy boost in your mood, which stems from the increase in serotonin production your body produces when taking the Garcinia. I started taking the Garcinia about a month ago but not really sticking to a diet and lost 4 1/2 pounds. I will now try to watch what Im eating to see if I lose more. Very pleased with the results.